Grasses for Hot, Dry Climates. See Ground Cover for plants that can substitute for lawn grass. All of the grasses listed below are warm-season, dry-soil grasses. Cool season grasses are inappropriate for most desert regions because they need spring rains, often moist soil, and may go dormant during summer heat. Except as noted, the grasses below are perennial, are bunch grasses rather than turf-forming, and require full sun. Grass plants reproduce both sexually with seeds and asexually using stolons and/or rhizomes. Stolons are specialized stems that run horizontally above ground. Rhizomes are stems that run horizontally underground. Both form nodes at intervals which produce roots and new shoots. The new shoots are clones of the original plant. Most, but not all, grasses will tiller if mowed when they grow above 3" in height. Tillering is the production of new shoots, often from the edges of the clump. In the southwest desert it is best to mow at a four inch height so that shoots will shade the soil and keep roots cool. A mulching lawn mower will drop its cuttings on the ground which helps insulate the soil to prevent heating and moisture loss. Grows 1' to 3' tall. Medium-width, gray-green leaves. Purplish flowers on one side of stalk bloom in summer. Can be turf-forming under ideal conditions. Native to North America. Water once a month. Will not tolerate grazing or mowing; mow when dormant. Grows 1' to 1.5' tall. Narrow, gray-green leaves. Reddish-purple flowers bloom in summer and produce flagged seed heads. Native to North America. Water once a month. Do not mow during the first year until dormant to strengthen roots. Does not tolerate foot traffic. Grows 1' - 4' tall. Medium-width, blue-green leaves. Cottony seed heads appear mid summer to fall. Native to Arizona through Texas, Colorado, Oklahoma and Mexico. Thrives in well-drained soil. Needs only rain, but water once a month in drought for more robust growth. Annual; should not be grazed or mown until seed heads drop. Grows 1' to 2.5' tall. Narrow, green, slightly fragrant leaves. Stems, arched or straight, form an attractive round grass clump. Tiny, unshowy flowers bloom summer through fall. The plants develop black seeds with a single long awn a sharp spike at opposite ends. The awn twists as it alternates between dry and wet, and can drill the seed into soil and even injure animals if it gets caught in their fur. This widespread, tropical, African and Asian grass is naturalized from California to Texas and Florida. 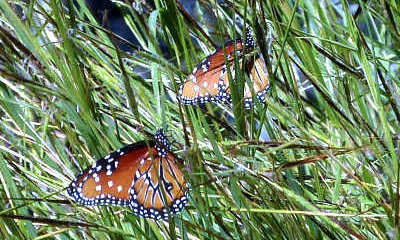 Butterflies, such as the Queen butterflies above, are attracted to this plant when it flowers in the fall. Photo taken November 5 at noon, Tucson. Rapidly grows 3' to 4' tall. Narrow, glossy green leaves. Pinkish-red flowers, looking spectacular in front of a setting sun, bloom in fall. Native to Eastern United States and Gulf coast. Water every two weeks. Reseeds only in damp soil. Shear dead leaves and spent flowers in early spring. Rapidly grows to 6' tall. Spreads slowly with rhizomes to a 5' wide clump. Bright yellow-green, fern-like leaves have a miniature bamboo look. Insignificant flowers. Native to Arizona and Mexico. Best appearance if watered every two weeks. Grows 2' to 3' tall. Blue-green leaves are slightly wider than Deer Grass. Dark purple flowers bloom in fall. Parent species native to Arizona through Texas and Mexico. Best appearance if watered every two weeks. Full sun to part shade. Grows in a clump 1' to 2' tall and 2' to 4' wide. Blue-gray arching leaves. Rosy flowers on flower stalks up to 5' high bloom in fall and age to gray, persisting into winter. Native to Texas, Mexico and Central America. Water once a month. A mounding grass that rapidly grows to 4' tall and wide. Narrow arching green-gray leaves. Purple to yellow flowers, not showy, bloom in fall. Native to California through Texas, Nevada and Mexico. Best appearance if watered every two weeks. Reseeds in damp soil. Grows 3' tall. Narrow blue-green leaves turn red or purple after frost. Some varieties have blue leaves. Purplish or bronze flowers bloom late summer through fall. Seeds, fuzzy white at tips, attract birds in winter. Native to North America. Needs soil that dries quickly. Full sun to part shade. Grows 3' to 4' tall. Blue-green medium width leaves. Yellow to orange flowers bloom fall to winter. Native to North America. Best if watered every two weeks. Shade intolerant. Grows 1' to 3' tall. Medium-green, narrow leaves. Rosy flower spikes bloom June through summer. Used for soil reclamation projects. Native to Western North America. Water once a month. Needs well-drained soil. Grows 3' to 6' tall. The cultivar, Giant Sacaton, grows to 8' tall. Medium-green, narrow leaves. Yellow to reddish flowers bloom in fall. Native to Southwestern United States and Mexico. Water once a month. Needs well-drained soil. A great plains native that grows 6" to 1' tall. Medium-green, narrow leaves. Turf-forming with stolons. Deep roots provide excellent erosion control. Regrows after a fire. Native to Central North America. Takes extreme heat and drought, but goes dormant in prolonged drought. Needs well-drained soil. Water once a month to root depth. Grows 4" to 16" tall. Gray-green, narrow leaves. Insignificant flowers on palmate spikelets bloom summer to mid-fall, allowing propagation by seed. Turf-forming with rhizomes and stolons. Considered invasive. Regrows after a fire. Grows dense under the pressure of grazing and mowing. It is the owner's obligation to mow this grass, possibly to a 2" height, to prevent flower and seed development that can lead to it escaping unchecked into the wild. Native to Africa. Deep roots give it the ability to withstand drought. Excellent erosion control. Appearance improves if watered more than once a month. Grows 4' tall. Edges of leaves are saw-toothed, can inflict a nasty cut. Showy white flowers on 6' stalks bloom mid-summer and feathery seed heads persist into fall. Native to South America. Does not reseed easily. Roots compete with native plants for moisture and nutrients. A bamboo that is quick to establish, with edible shoots, and useful as a hedge or windbreak. It is heat tolerant and drought tolerant once established. A typical height is 40-50' tall, with a stalk diameter less than 3". It can be maintained at 16' tall by removing the oldest stalks in the spring and letting new, shorter ones take their place. Space each plant 5' apart to establish a hedge. Full sun to light shade. USDA hardiness zones 6b-10.